The typical weather conditions of our country are well known, and they were given high priority before going to the drawing board. Adapting a building to our climate – warm, dry and very sunny with temperatures quite often above 35ºC (95ºF), was initially very difficult. Still its location was in due time seen as an advantage, to use the most practical energy saving resources. Humidity is rather high in Malta (since Malta is an island) and summer temperatures, especially in August and September can lead to extensive heat stress, thereby making it quite often unbearable to stay out. However, daytime temperatures in summer are usually mitigated by cooling sea breezes, especially along the coast whilst the annual rainfall in Malta is rather low. The same building itself takes advantage of the sun and wind, two factors directly affected by climate change. Their importance was noted in the construction of the self sufficient building by using the same resources according to the season. The two prevailing winds in the country are the North West and the South East. Two low windows opposing both wind directions were integrated in the external walls, and wind is channelled under the main structure to the internal multi-purpose room. Two louver windows are found in this room to control the breeze according to the season. All new structures are elevated and with a total void areas. This will eventually help to work opposite to the external weather in terms of temperature i.e. in summer the underpassing wind will cool the structure, whilst in winter when closed, humidity will be practically negligible. No de-humidifying appliances are needed for the operation of the building. The direction and height of the sun in Malta changes throughout the year. On 21st December, the shortest day of the year, the sun takes the lowest path and ‘operates’ for less hours. In contrast, on 21st June, the path is high and the number of hours more. The cantilevers facing the south have been projected to a considerable span in order to avoid the summer sun rays, whilst gaining winter sun rays. The fundamental principle of solar design, “to maximise the solar gain in the winter and minimise it in the summer”, will be met. The large glass apertures facing the south are a vital component of environmental design since during the day less electrical lights are needed to the function of the building. Apertures are all double glazed to reduce energy losses. Surfaces facing North are in the shade all year round. Whilst most sun is received in the arc South East to South West, the adjacent quadrant, North-East to North-West, receives very little sun except at the peak of summer. For this reason these areas were designed with small apertures. All the ‘second hand, Globigerina Limestone is nine inch standard size. When such stone is reduced in thickness it will not function properly in terms of stabilising internal temperature. Apart from the issue of thickness the Globigerina Limestone is very porous. 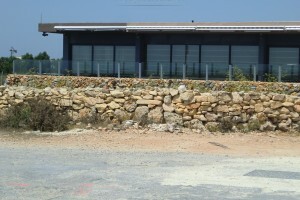 Weathered Globigerina limestone forms a hard crust which will help in insulating the building. Again such material is found at the North West, the North and The North East of the building. Water tanks are also placed in the stepping area of the building. This area was chosen both to reduce visual impact and to reduce sun rays and wind affecting the same water tanks. The screening will continue to reduce visual impacts and external elements. The colour of the water tanks is white again to improve the cooling effect. Surfaces that are more horizontal receive most of the sun in the summer. A two inches jablo layer covers the roof of the structure in order to stop heat loss and reduce summer heat. The thermal mass of the building (capacity to store and regulate internal heat) is adequate. Apertures are facing all wind directions thus any summer breeze will cool the centre and change the flow. The same breeze will be directed to the multipurpose room through underground channels. Walls facing the North, North West and North have a high thermal mass whilst apertures facing the South, South West and South East have a relatively low thermal mass. Freshwater availability for competing agricultural, industrial, household and other uses is rapidly becoming one of the most critical natural resource issues in Malta. Rapid expansion of the tourism related infrastructure and services is amplifying the problem by placing considerable pressure on the scarce local water supply. This can lead to serious shortages and price rises in the nearby future. Reducing water consumption and protecting water quality are key objectives in the building concept. This issue was given great importance since, in Malta, the demands on the supplying aquifer exceed its ability to replenish itself. To the maximum extent feasible, the building depends on water that is collected, used, purified, and reused on-site. The reservoir constructed has a capacity in cubic meters of 60% of the roof area. Water is harvested from all the committed site area so that any early rain water (August/September) is managed effectively. Secondary water is mainly used for the toilet facilities, landscaping and external cleansing. The Installation of a reverse osmosis and ultra filtration water treatment equipment will help in water-saving and provide a drinking water system. Such a system will also result in a reduction in waste due less water plastic bottles required, as well as the need for extra storage of plastic containers. 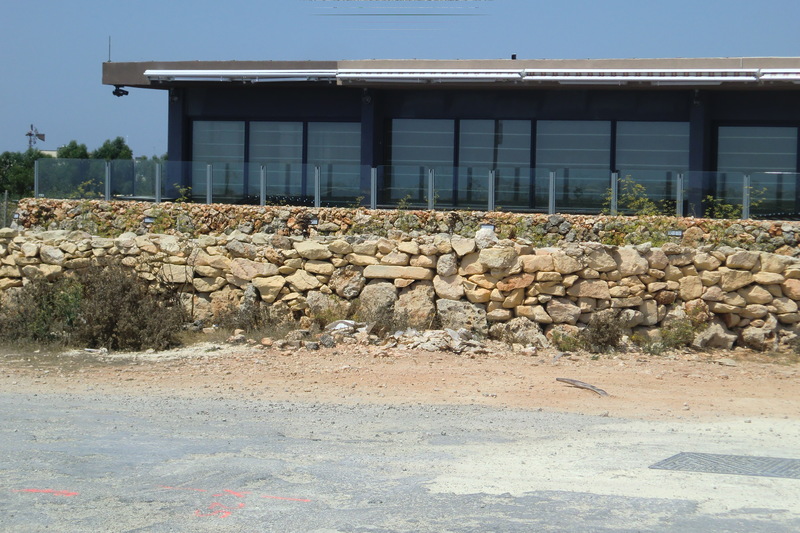 All the rubble walls- these were constructed from typical loose stones found in the area. 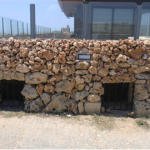 All the stones and debris for the rubble wall were extracted from the site area. 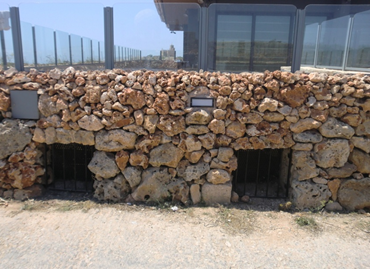 Remaining window apertures and iron railings found on site were sandblasted, painted and reused for the same apertures. Cast iron pipe works which were not present when construction initiated were brought from the Handaq School which was demolished in summer 2011. This was done following consultations with the Foundation for Tomorrow Schools. 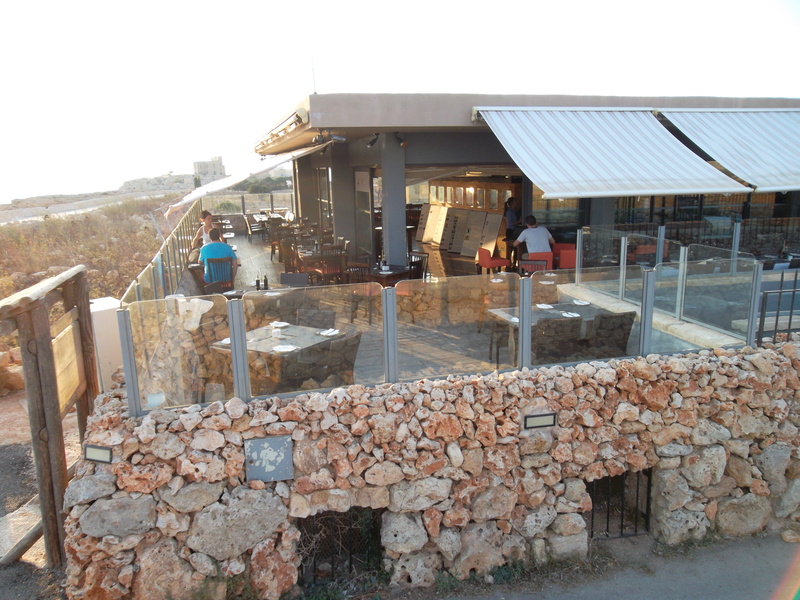 Most of the Globigerina Limestone was brought from rubble mounds dumped illegally in the Dingli countryside. OPERATION – The building also helps to reduce the amount of waste generated by the users as well, by providing on-site solutions such as compost/biodegradable bins and waste separation bins to reduce matter going to landfills. The centre will promote an active policy of waste avoidance. It will minimise, re-use and recycle waste and use recycled items wherever possible. All waste will be disposed through safe and responsible methods. All external apertures are double glazed. This will eventually help in containing noise. All light fixtures are energy saving. La Pinta Ltd is aware that reducing greenhouse gas emissions will not only result in improvements to the planet’s environment but also save money. Global energy prices are rising, making it harder to afford to travel, heat and light. The already mentioned issues will help to have a project with limited amounts of green house gases output by limiting energy usage and emissions from transportation (walking, using bicycles or public transport,), as well as from the structure itself, equipment, and processes. Reducing the need of electricity in the centre will help to reduce the green house gases that are normally produced from similar operating facilities. Light pollution: Light pollution was taken into consideration when designing the project. As the site is next to cliff ridge special attention was undertaken in order not to disturb the sea bird colonies. This was taken into consideration during the formulation of the Environmental Assessment. Other light pollution issues taken into consideration are the use of down lighters and cut off systems.